Save up 50% off Retail. Don't see the Triangulo product your looking for? Call 407-925-0917 for DIRECT PRICING!!! TRIANGULO Exotic Engineered Hardwoods utilizes the highest quality engineering process in the industry. Each of the under layers of real wood (or plies) is glued under pressure in different directions for strength and durability. This cross-ply construction results in a product this is more stable than solid hardwood flooring. The stability of Triangulo hardwood flooring refers to susceptibility to shrinkage and expansion caused by environmental conditions. It is this additional stability that allows for Triangulo engineered hardwoods to be installed over a mature concrete slab and may be installed in multiple applications; unlike solid wood floors. TRIANGULO Exotic Solid Hardwoods is fabricated from 3/4" thick solid wood and has tongue and groove sides to join the boards. 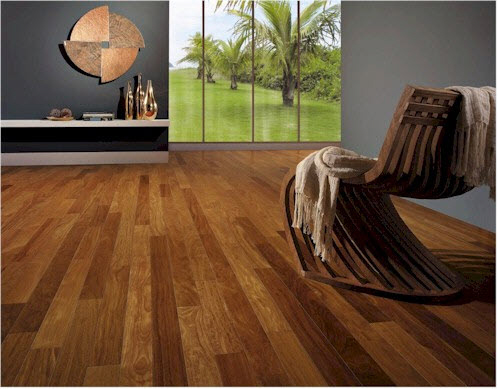 The truly random nature of our exotic solid hardwood flooring will ensure that no application will look alike. The Triangulo crystal clear pre-finishing process applies as many as 9 coats of Aluminum Oxide for maximum durability and enhanced beauty. Like our thick-sawn engineered products, the principal advantage of solid wood flooring is its ability to be re-sanded and refinished over many years. It is not uncommon for solid wood floors to last longer than you own your home.